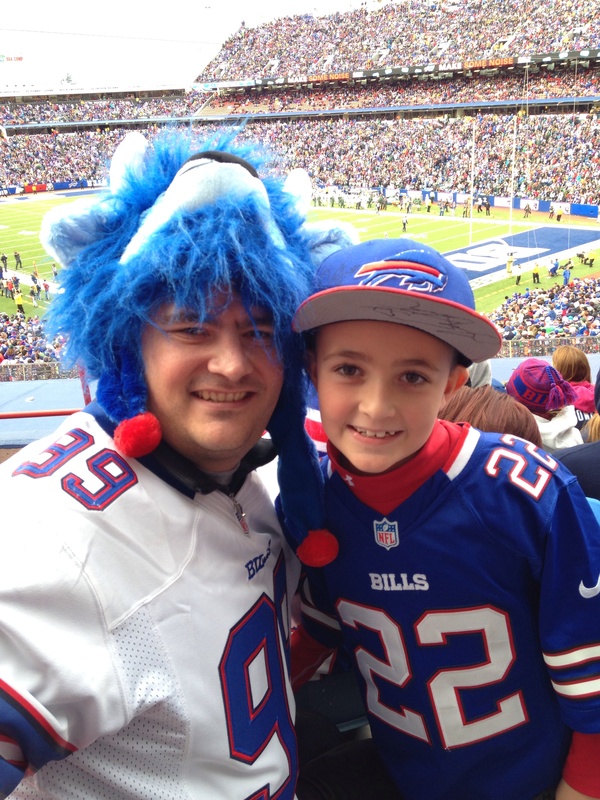 Congratulations to the winner of the Atwal Father’s Day contest, Mike Glorioso who shared his story of his favorite Bills memory with his son. Mike won an invitation for four to Bills practice where he will meet Coach Marrone and a $1,000 gift certificate from Atwal Eye Care. I attended every home game with my son (now 9 years old) but one game really stood out. One drive really. It was the Carolina game and we were down by 6 with under two to go. Carolina had the ball deep in Bills territory. Lots of fans in our section were leaving and my son asked why. I said that they don’t think the Bills would pull it off and without hesitation he said “What? We have EJ. We’re going to march down and win.” Well the panthers go on 4th and inches. We stop them and get the ball with a long way to go. From the first play of the drive to the TD he knew this game was ours. He was right and when they scored we were all jumping up and down, I knew we had a little billiever for life! I don’t think I ever saw him so happy and I loved seeing the raw faith he had in his Bills. Check out some fan submissions in the photo gallery.